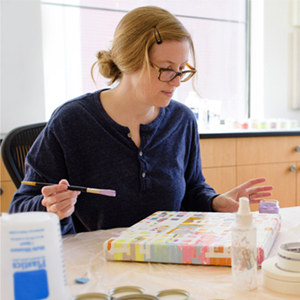 Raised in Weston, Massachusetts and Portola Valley, California, Hadley Williams received a BS in Social Work from Cornell University and an MFA in Studio Arts from John F. Kennedy University. Hadley is represented by SLATE contemporary in Oakland and recently exhibited there in a show with Kerith Lisi and Brian Singer entitled Of Method & Material. The show received an Arts Feature review by DeWitt Cheng in The East Bay Express on Feb. 5, 2019. A solo show of new work was exhibited in 2018 at Manna Gallery in Oakland. Juror Linda Connor selected one of Hadley's pieces to be included in the exhibition Black & White and Shades of Gray at O'Hanlon Center for the Arts in Mill Valley. Juror Matt McKinley chose another of her paintings to be exhibited in Artist Choice at San Francisco Women Artists gallery. Arc Gallery in San Francisco exhibited four paintings in its Squared Alumni show curated by Michael Yochum. Hadley participated in the invitational show Collect at the Berkeley Art Center, and the painting in the show is featured in the Berkeley Times newspaper. Other shows include ABSTRACT juried by Frances McCormack at the Sebastopol Center for the Arts, Reimagining Minimalism curated by Don Soker at The O'Hanlon Center for the Arts, and Abstract Preferences organized by Anthony Pinata at NIAD Art Center in Richmond. Hadley's work was in an exhibit curated by the Oakland Museum of California at the Oakland International Airport and has been exhibited at Campfire Gallery in San Francisco, Gray Loft Gallery, Mercury Twenty Gallery and Branch Gallery in Oakland, Local 123 Gallery and Arts and Consciousness Gallery in Berkeley, Los Medanos College Art Gallery, San Pablo Art Gallery, Piedmont Center for the Arts, Start Here San Francisco and the Berkeley Civic Center. Her art is published in California Home + Design Magazine, the literary journal 580 Split, the Berkeley Times, Piedmont Post and The East Bay Express. It has been featured on the websites of the Oakland Museum of California, Jute Home interior design, Bay Area Visual Artists Network, Hanson Digital, City Picture Frame, Suite Five Salon, Art Business and Pivot Gallery. An article about her art and home renovation project is published in the September 2015 Luxe Interiors + Design San Francisco magazine. An October 2016 Diablo Magazine article on her home features Hadley's permanent art installation of glass disc windows. Hadley’s shows received two Critic's Picks reviews by DeWitt Cheng in the East Bay Express and two Critic's Choice reviews by Jeanne Storck and DeWitt Cheng in The East Bay Monthly. Her work is in corporate and private collections in the United States and Switzerland. She paints in her Oakland studio and lives with her family in the East Bay. In my abstract paintings I use repeated, handmade forms to create clusters, fields or grids. My recent works incorporate paper, gouache, acrylic and graphite on canvas. I cut vintage paper to make a grid of individual units that I connect with another layer, such as graphite circles, sprayed acrylic paint, circles made of gouache on watercolor paper, or pinholes. I am exploring separation and relatedness, perfection and imperfection.